Thanks to this crew of people who helped us Spruce Up Wohelo last Memorial Day Weekend. Several severe storms had left us with LOTS of downed branches and trees. It is amazing what almost 40 people working hard, 3 trucks and a big wood chipper can accomplish! 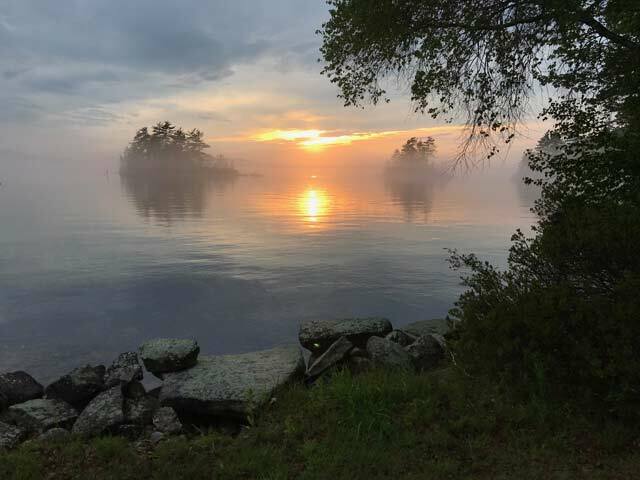 Foggy Sunset over Blueberry Islands Photo above by Connie Cross during the Spruce Up Weekend. A Wohelo tradition of working together. Here Halsey Gulick with campers and staff. Another highlight of the weekend was Holly putting together our new rug loom, donated by Natalie Dyer. Both she and Louise made beautiful samples. We think this will be popular this summer. May Wohelo Bird Newsletter- you should have received this last week, if not please check your mailing address with us. Camper families and alums you can check at your Camp InTouch Account . While you are there you can look at the May Wohelo Bird on-line in the Forms and Document sections. Others can e-mail us address changes to wohelo@wohelo.com. Islands in the sky – great drone shot of the islands!